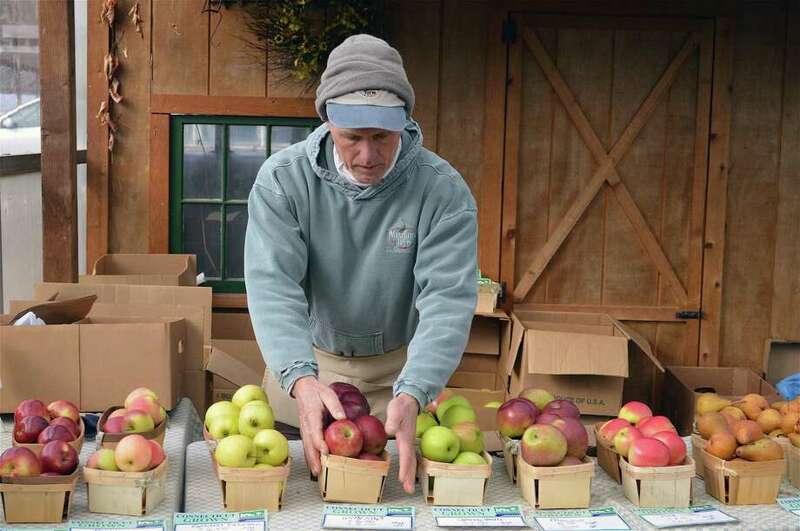 Pete Teveris of Woodland Farm in South Glastonbury displays apples at the wintertime Westport Farmer's Market, Saturday, Jan. 12, 2019, in Westport, Conn.
WESTPORT — Fresh food, warm spirits and a healthy sense of community earmarked Saturday’s Westport wintertime farmers market. Hosted inside by Gilbertie’s Herbs & Garden Center on Sylvan Lane, despite the cold weekend weather, the market kept its followers warm and will continue to do so at this location through March 16. “I think the winter market is such a nice space,” executive director Lori Cochran said. “It’s super warm and it’s a great place to slow down and just enjoy some nice people, and just a respite from the New England weather,” she said.